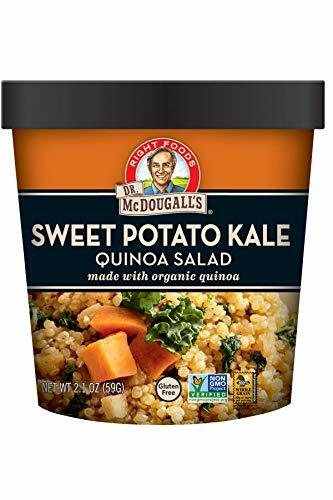 Enjoy the delicious taste of sweet potato, apple, and kale in Dr. McDougall’s Right Foods Sweet Potato Kale Salad. We believe in the power of great food, so we partnered with organic quinoa farmers to bring you a grain that works for your busy lifestyle. Our quick-cook organic quinoa cooks right in the cup. Enjoy it on its own or with extra superfoods and veggies for your natural delicious wellness. Gluten free! INSTANT GRAIN SALAD MADE W ORGANIC QUINOA: Enjoy our Quinoa Salad wherever you go. We partnered with Organic quinoa farmers to bring you a quinoa that works for your busy lifestyle. Our perfectly seasoned organic quinoa cooks right in the cup. Delicious!